Hi there! You know the Trans-Neptunian Objects, these bodies which orbit beyond the orbit of Neptune… There are the furthest known objects in the Solar System. 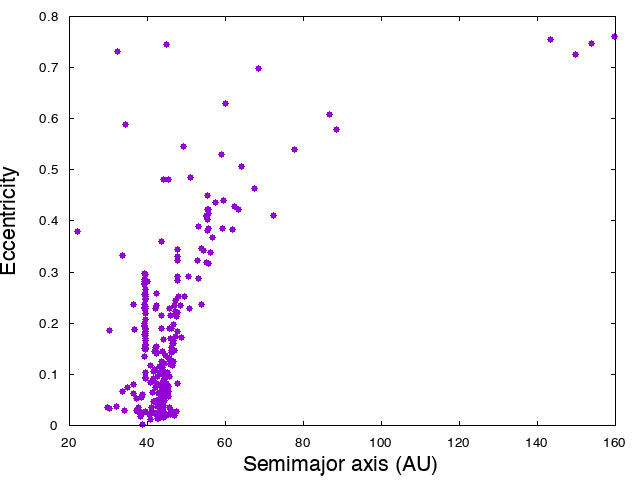 Today I will particularly tell you on the most distant of them, which have a semimajor axis larger than 150 AU, while Neptune is at 30 AU… Yes, we can observe some of them. 6 have been recently discovered by the OSSOS survey, in OSSOS. VI. 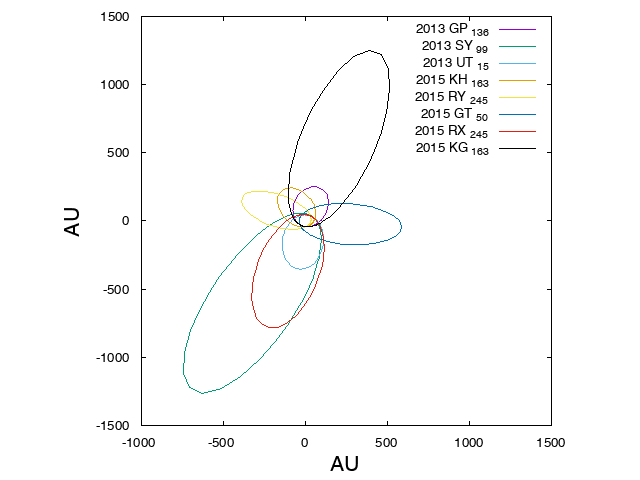 Striking biases in the detection of large semimajor axis Trans-Neptunian Objects, by Cory Shankman and 11 collaborators (full list at the end). This paper has recently been published in The Astronomical Journal. In this study, the authors particularly focus on the possible observational biases, and discuss the Planet Nine hypothesis. What about the Planet Nine? 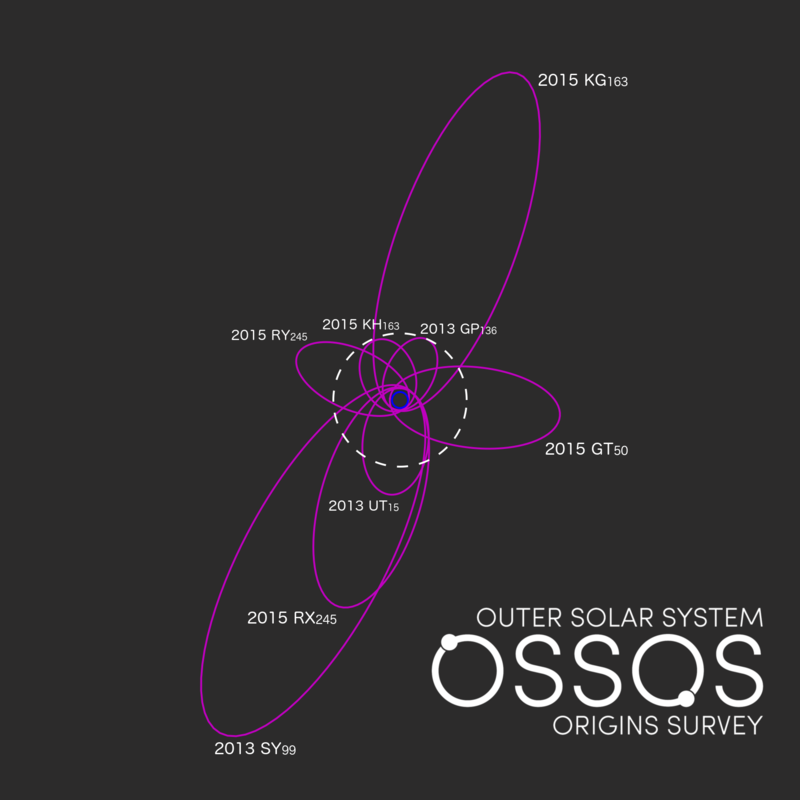 I should probably write OSSOSurvey instead, since it stands for Outer Solar System Origins Survey. It is a systematic observation program that ran on the Canada-France-Hawaii Telescope (CFHT) between 2013 and 2017, devoted to the discovery and orbit determination of Trans-Neptunian Objects. For that, the program used an imager with a field of 1×1 degree, to image 21 square degree fields, in different parts of the sky. During the 4 years, these fields were regularly re-observed to follow the motion of the discovered objects. 16 months of astrometric observations are required to obtain an accurate orbit. The authors announce that OSSOS permitted the detection of more than 830 TNOs, with a “40% detection efficiency at r(ed)-band magnitude 24.4-24.5”. OSSOS followed another survey, CFEPS, for Canada-France-Hawaii Ecliptic Plane Survey, which discovered some 200 Kuiper Belt Objects, i.e. Trans-Neptunian Objects, which are not as far as the objects we discuss today. This makes more than 1,000 small objects discovered by the CFHT. Some TNOs detected by CFEPD and OSSOS. Replotted from the public data. Copyright: The Planetary Mechanics Blog. The Canada-France-Hawaii Telescope is a joint facility of the University of Hawaii, the French Centre National de la Recherche Scientifique, and the Canadian National Research Council. It has also partnerships with institutions based in the two Chinas, South Korea, and Brazil. It has a 3.58-m telescope, which is functional since 1979. It is ideally situated, close to the summit of the Mauna Kea mountain, Hawaii (altitude: 4,204 m). It is equipped of different instruments, to observe in the visible to infrared bands. One of them, the wide field imager MegaCam, was used for OSSOSurvey. If you are looking for stars to the West, you will find some. But only on the West, and brighter than a given magnitude. Does that mean that there are no fainter stars, and no stars in the opposite direction? Of course not. You have found only those stars because your observation means and protocol precluded from discovering other stars. This is an observational bias. The direction in which you observe. Since our sky is moving, this is strongly correlated to the observation date. The weather. Hard to see something behind a cloud. Your field of view. Is there something behind this tree? The limitations of your instrument. The albedo of your object. How efficiently does it reflect the incident Solar light? There is something very significant in the name of CFEPS… E stands for ecliptic, which is the orbital plane of the Earth. The Solar System is roughly planar (with many exceptions of course), and it made sense to look for objects with a small orbital inclination. Consequence: most of the objects discovered by CFEPS have a low inclination… observational bias, which was in fact a way to optimize the chances to discover objects. But it would be wrong to conclude from these discoveries a lack of objects with a small inclination. OSSOS had observational biases as well, mostly due to the absence of observations in the direction of the Galactic Plane, and to the allocated observation time. The Galactic Plane is full of stars, which complicates the observations of faint objects. This is why the authors maximized their chances in avoiding that part of the sky. As a consequence, OSSOS could not detect objects with an ascending node (the point where the orbit of the object crosses the ecliptic) between -120° and -20°, and had a poor sensitivity between 115° and 165°. In the specific case of extreme TNOs, there is another bias due to their dynamics: a small object orbiting at a distance of 150 AU has no chance to be detected from the Earth. So, the only detected objects came close enough, which means that their orbits is highly elongated, i.e. highly eccentric. The 8 objects considered in this study, i.e. 6 newly discovered and 2 already known, have a pericentric distance between 31 and 50 AU, which involves an eccentricity between 0.727 and 0.932 (the eccentricity of the Earth is some 0.016). Among the extreme TNOs, only the highly eccentric ones can be detected. This does not mean that they are all highly eccentric. The reason why the scientific community became excited about the Planet Nine is that a clustering of the orbits of the extreme TNOs was identified in other data, in particular a clustering of the pericentres of the objects. It was then concluded that this clustering was the dynamical signature of the Planet Nine, proving its existence. OSSOS gives independent data, are they clustered? Answering such a question is not straightforward when the data are scattered. Looking at them with the naked eye is not enough, there are mathematical tools which can measure the statistical relevance of an hypothesis. In particular, the Planet Nine hypothesis should be compared with the null hypothesis, i.e. an equal distribution of the pericentres of the extreme TNOs. A common tool is the Kolmogorov-Smirnov test, or KS-test. The idea is to determine a distance between your sample and the one that a given law would give you. If the distance is small enough, then it makes sense to conclude that your sample obeys the law you tested. This test has been refined as Kuiper’s test, which is insensitive to cyclic transformations of the variables. Cyclic phenomena are everywhere in orbital dynamics. The following table presents you the 8 eTNOs presented in this study. All of them have been discovered by OSSOS, the first two ones being known before that study. The 6 other ones are the 6 newly discovered. We can see that all have huge semimajor axes and eccentricities. You can see the high relative magnitudes in the red band during their discoveries. Their discoveries were made possible by their high eccentricities, which reduce significantly the minimal distances to the Sun and to the Earth. And now their orbits are drawn! Projection of the orbits of the 8 eTNOs on the ecliptic. The orbit of Neptune is embedded into the small circle delimited by the orbits. Copyright: The Planetary Mechanics Blog, after inspiration from OSSOS. The Kuiper’s test used by the authors say that the orbital elements of the detected eTNOS are statistically consistent with a uniform repartition. We must be careful with words. This means that there is no evidence of clustering in this sample. That does not mean that there is no Planet Nine. We should keep in mind that 8 objects do not constitute a statistically relevant sample. My feeling is that if you were skeptical about the existence of the Planet Nine, you remain skeptical. However, if you believed in it, there is still room for belief. The fact is that this study does not comfort the existence of the Planet Nine. The study, made freely available by the authors on arXiv. You can also find a presentation of the study by the authors themselves here. The website of the OSSOS survey, and its Twitter. The quest for the Planet Nine. Kat(hryn) Volk, on Twitter as well.